We had a wonderful Skype interview with the truly inspiring keynote speaker, Peter Docker. 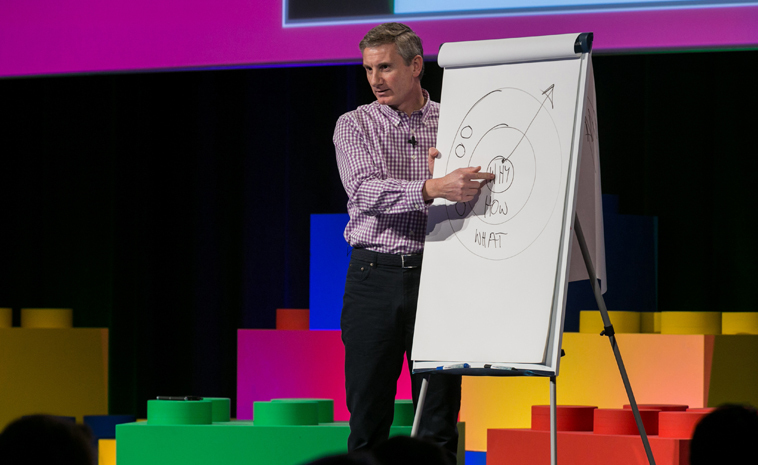 Influenced by the Golden Circle theory, Peter has collaborated with Simon Sinek since 2010. As part of the Start With Why team, he is one of their ‘Igniters’ and Implementation Specialists. He’s an internationally known keynote speaker, coach, and workshop facilitator, having ignited audiences in over 75 countries. Peter is focused on helping organisations harness the power of WHY. The results? Great places to work with sustainable high performance. He illustrates his insights by drawing on examples from his previous flying and military experience, and industry career, to explain simple and yet powerful ideas that can be applied in any business. Whirling Chief had some questions for Peter about Leadership and Start With Why. As well as being a member of the Start With Why team, you also support the company WhyNot Partnering, focused on creating Why-based Organisations. Could you please educate us about the purpose of your work and approach? Sadly, the vast majority of us spend the vast majority of our lives working for someone or something that we don’t find fulfilling. Indeed, a Gallop poll shows that around 80% of people are disengaged by the work they do. Our aim is to reverse that statistic, and we believe that starts with having clarity of WHY – as an individual or as an organisation. First explained by Simon Sinek in his 2009 TED talk, our WHY is our higher purpose, our cause, our belief. It’s what inspires us to get out of bed every day and reflects who we are when at our best. A WHY explains the contribution and impact we make in the world, be it as an individual or as a company. Everyone has a WHY – it’s just that not many of us can clearly articulate it. We help people get clarity of their WHY and teach them how to use the energy it releases. Why is it so important for leaders to clarify WHY they do what they do? First of all, although those at the top of an organisation often have a formal leadership role, ‘leadership’ is a choice – it’s not a rank or position. It’s a choice to serve others. Anyone can make that choice and it usually means a level of self-sacrifice, too. Other than that, the only thing you need to be a leader is to have a follower! Well-known leaders who inspire great following – such as Nelson Mandela, Martin Luther King and Malala Yousafzai – made the choice to serve others and all experienced self-sacrifice. These leaders were also very clear on their cause – their WHY – which made it easy for those who believe the same thing to choose to join them in their cause. It’s these followers who help to bring the leader’s cause to life and they are also willing to make their own sacrifices along the way. The leader doesn’t need to have all the answers. On the contrary, the most important role for the leader is to ‘hold the space’ for others to contribute and come together to solve the challenges. It’s exactly the same in businesses that are inspired by a WHY. Elon Musk is a leader who is committed to the future of the human race and, as a significant part of that, creating sustainable energy and transport. He has made personal sacrifices along the way (his company Tesla has cost billions of dollars of his own money) and his ideas have, at times, been ridiculed. And yet he has a huge following of loyal people – be they customers who buy his cars, engineers who join his company to help him solve the challenges, or just people who cheer his cause. None of this is possible – or sustainable – without the context of a clearly articulated WHY. Many leaders think of their WHY as being the same as their vision for their company. Reading Simon’s book and looking at your work, it’s clear that you consider a WHY and a Vision to be different. Could you elaborate? You know, there is no universally accepted definition in business for a Vision, although most companies have them, often expressed as ‘To be the best in [sector]’ or ‘Most respected in X.’ As such they are broadly meaningless and don’t inspire people to action. No one knows what ‘to be the best’ or ‘most respected’ looks like. Here’s my take on it. While a WHY and a Vision are related, they are not the same. For example: when a company is formed, the founder is passionate about what they want to achieve. They have to be if they want to succeed; it is not logical to start your own business. (The logical thing is to get a ‘proper job’ – one with a guaranteed income and pension!) The founder’s drive will come from their individual WHY, which is drawn or discovered from their past life experience and who they are when they are at their very best. The smart founder will then surround herself with those who believe what she believes – in other words, those who have a similar or complementary WHY. The WHY of the founder becomes the WHY of the company. A Vision, on the other hand, is a projection of the WHY into the future. The WHY is just a tool. A Vision clearly articulates the image of what the world will look like as a result of the contribution and impact the organisation wants to make. We are visual animals and so a Vision needs to paint that picture so as all involved know what they are working towards. Simon Sinek describes a good Vision as being like a race finish line. We might not know how far away the finish line is, but we will all instantly know when we get there. Martin Luther King had the Vision of little white boys walking to school hand-in-hand with little black girls. For the Start With Why team, our Vision is a Golden Circle on every desk. In each case, the Vision is inspired by the WHY and it’s easy for everyone to see what they’re striving for and how they might contribute. You engage with many leaders through your work. Would you share with us some of your observations as to how leaders manage to create alignment in their organisations? What are some of the common challenges you witness? How could one collaborate to overcome those challenges? One of the most frequent questions we hear during workshops is, “How can I get them [employees/team members] to do X or achieve Y?” Without exception, the answer lies directly in the hands of the (usually senior) person asking the question. You see, it is not sustainable to force people to change or do things in a certain way. Once we stop ‘policing’ them, they are likely to return to the previous state. Any of us with children will have experienced that! The only way to create a sustainable shift in behaviour is when people are inspired to do things differently. To create such an environment, great companies have a clear WHY Statement; think, act and communicate starting with WHY; have discipline of How (their guiding principles or values); and consistency of What they do (their products or services). This then creates the foundation on which to hire the right people. More often than not, companies rush into hiring people just for their skills, not for a shared belief – and that’s just storing up problems for the future. The military, who have a very strong culture, hire people who demonstrate not only potential, but importantly who also fundamentally want to serve a higher purpose (a WHY). They then train them in the necessary skills and, after training, they just ‘fit in’ to the wider organisation. When we hire people who believe what we believe we create the basis on which everyone pulls in the same direction. People can then be led rather than those at the top of the company having to rely mainly on management systems and processes to get things done. While management principles are still required, they can then become focused on enabling people, rather than constraining them. It’s a very different environment indeed. As ever, it always comes back to the WHY. Culture building is a cornerstone of your work. What advice do you have for our readers? What steps could they take to create better meaning for their employees? Great cultures are built around a strong sense of higher purpose – a connection to the contribution and impact we want to have in the world. A culture is often difficult to put into words or to ‘bottle,’ and yet we can all sense the culture of an organisation when we are immersed in it. A clearly expressed WHY is, to steal your word, the cornerstone. When everyone in an organisation can say, “This is WHY we do what we do: we exist to [WHY Statement],” followed by, “And this is how that comes to life in my part of the company,” then you have a way to start expressing the cornerstone of your culture and make it real for others. It will open up the possibility to inspire those around you – be they people who want to join your organisation to help build the world you imagine, or loyal customers who will stay with you through thick and thin, or simply those who want to be advocates and cheer you as you move forward. As human beings we are emotional animals – it’s part of our biology. People make decisions based on what feels right – it’s how the biology works. People are inspired when they feel something resonates with them and they see fresh possibility. When we start with WHY we unlock the emotional centre of our brain where all our feelings reside. We start to work with the biology. Thanks so much for sharing this interview. I cannot agree more. As an employee for me it is very important that the company or the leader lets me feel that I am important. Only then I will be successful. This is why when leaders (and I am not saying bosses) change the company often the good employees leave (hence follow) the leader. I think employees can only get inspired once they think they are part of the change. Once their leaders respects them and makes them feel that they are the most important person in the company. And once every single employee feels the same… then it is call being a real leader. Thanks again for sharing this interview. Hi Bengu – it’s Peter here. Thank you for your comments – I’m glad you enjoyed the article and the ideas resonated with you. Holding ‘respect’ for one another in any team or organisation is essential. Respect is simply about recognising and acknowledging the value every individual can bring to the world, regardless of their rank or position. When we create the space where others feel their voice can be heard, when they feel they can be part of the solution, then it can be the start of something truly extraordinary. The only person who can change a person, is themselves. Sustainable change occurs when individuals make the choice to shift perception and take different actions. In effect, organisations achieve change one person at a time. People make a choice when they feel inspired by a cause, a belief – a WHY. Is there a proven process to discover your WHY as a professional / leader? Can you tell us a little bit about it? Hi – it’s Peter here. Yes, there is a proven process. Just to be clear, we each have one Why and one Why only. It’s not as if we have one Why at work and another at home. As Simon Sinek says, if we are one person at work and another at home, in one of those places we’re lying. Thank you, Bengu and Ayse for your comments and to Peter for taking the time to respond. Lovely to see people connecting! I just want to mention I’m newbie to blogging and definitely savored you’re blog. More than likely I’m likely to bookmark your blog . You actually come with remarkable stories. Many thanks for revealing your web site. Hi, Neat post. There’s a problem together with your site in web explorer, may check this¡K IE nonetheless is the market leader and a big component of people will leave out your excellent writing due to this problem. Hiya, I am really glad I have found this information. Nowadays bloggers publish just about gossips and net and this is actually annoying. A good site with interesting content, that’s what I need. Thank you for keeping this site, I’ll be visiting it. Do you do newsletters? Cant find it.